Hi, I’m a Blue Lion. I like making stuff. I go through obsessive phases, usually accompanied by copious amounts of spending to equip myself to make such obsessions. My gramma taught me how to knit and sew when I was 7-years-old and I’ve kinda loved it ever since. I bought myself a sewing machine and a bust form a couple years ago and taught myself how to read patterns. I made some stuff, and mostly modified some clothes for friends. I made a sweet yoga mat bag for a friend, which actually didn’t fit because the accompanying mat I bought for her was the ‘extra thick’ kind. Anyways, I digress. My latest obessession has been crocheting. I taught myself last summer and have been hookin’ ever since. Mostly amurigurmi stuff, but some blankets too. I had to take a break because I gave myself mega-RSI, and I make sure I take lots of breaks when I’m making stuff now. 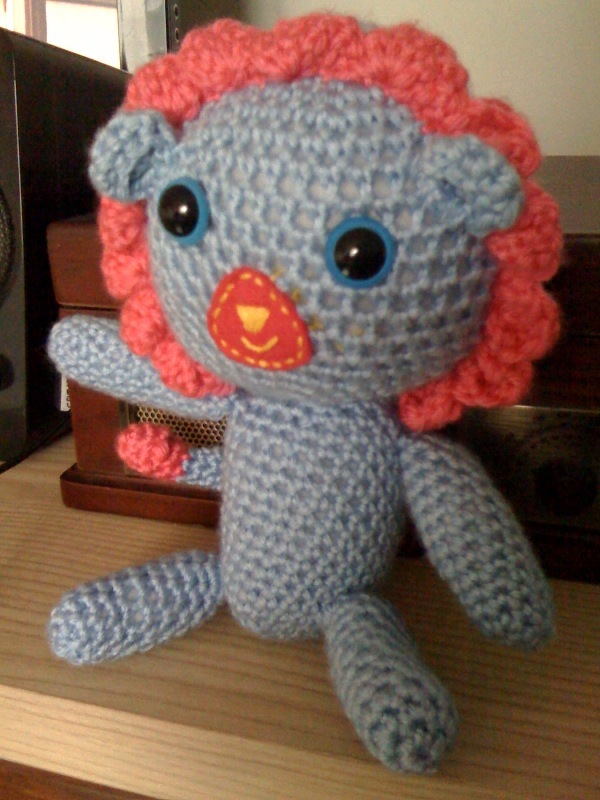 My last project is this guy, a blue lion for baby Damian, Erica & Aris’s beautiful son.